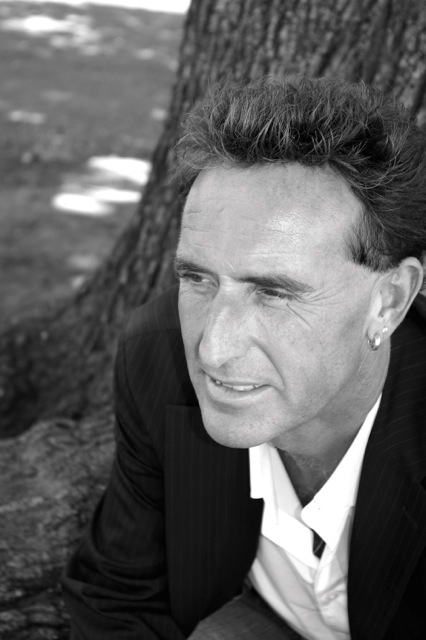 Martin Page, acclaimed songwriter, has included The Huntington in his estate plans. As a professional songwriter and artist, I’m always searching for that elusive elixir of inspiration, that spark that ignites ideas for songs. The Huntington is the place I go to open the mind, free the spirit, and break open the dam of creativity. I was first introduced to The Huntington by my manager, Diane Poncher, around the time I was writing my first two number one hits with Elton John’s lyricist, Bernie Taupin—”We Built This City” (Starship) and “These Dreams” (Heart)—and I was immediately aware that I had found my second home…away from the busy, stressful, overactive music studios of Los Angeles. I originally came from England, where nature—green fields and trees, the New Forest National Park—surrounded my childhood, so to come to The Huntington was a little like returning home, to a place that fed my soul with beauty and peace. My recently released solo album was largely created in my mind while strolling The Huntington grounds. In fact, The Huntington graciously allowed me to use an image of their wonderful sculpture, “Day” by Paul Howard Manship, as the album cover. 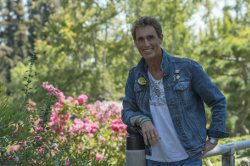 The album’s title, “A Temper of Peace” (a temperance of peace), is what I am able to attain while strolling the grounds, which I do at least twice a week. It’s where I tune my soul. It’s rare to discover havens that feed the intellect and heal the human condition—places that offer health and wholesome reflection. The Huntington is one such unique place, and I can’t think of a better institution to support. I am extremely proud to be part of its Heritage Society. The Huntington is grateful to Martin for his farsighted generosity. Hi everybody! Well, I haven’t done a blog for a long time, so I thought I’d share with you some recent photos and the stories behind them. No.1 – Say hello to Bo and Peep! 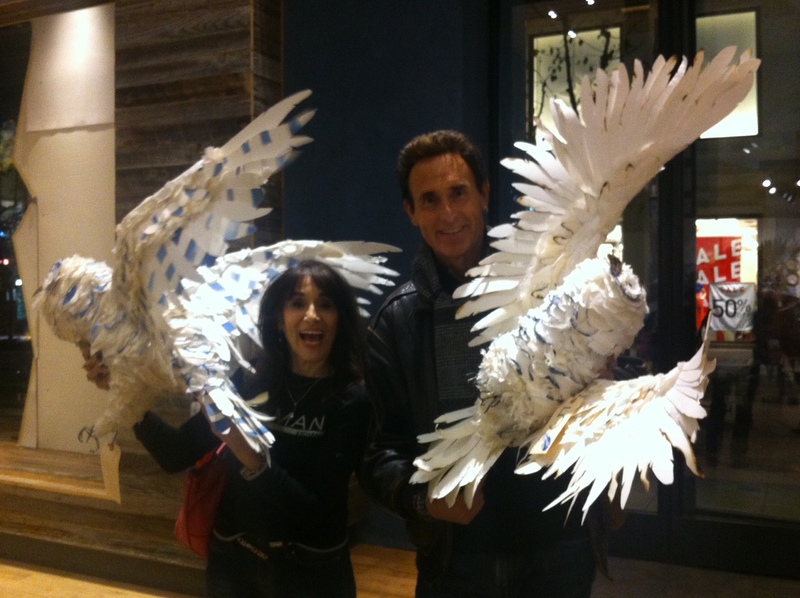 Two wonderful paper mache “owls” that I bid for after Christmas time at the Anthropology shop at The Grove in L.A. Anthropology opened bidding on these wonderful creatures (initially created for store displays by their infinitely clever creative department) after their Xmas decorations were set to be broken down to make way for new displays. The money from the auction was to go to the Wildlife Rescue Fund and the fund set up for the victims of the Newtown school shooting. I’m glad to say that I won the bid, and Bo and Peep will be featured hanging from the ceiling …. I mean FLYING in my new home-studio annex – “The Owl’s Nest”. The photo features Bo and Peep in flight, “carrying” me and my manager, Diane Poncher, after claiming our new companions to take them to their new home!! No.2 – This is the internet radio reunion of Q-Feel at an 80’s-based Audio Nowcast podcast. 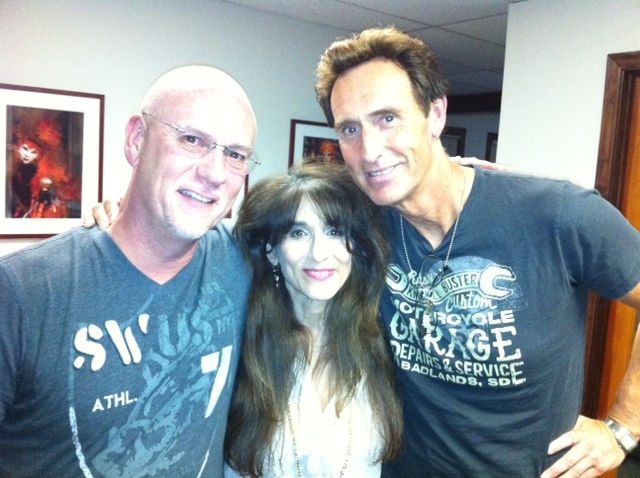 Pictured are Brian Fairweather and myself and Diane Poncher (who also managed & looked-after Q-Feel during the 80’s). It was wonderful for the three of us to be back together in the same room again. 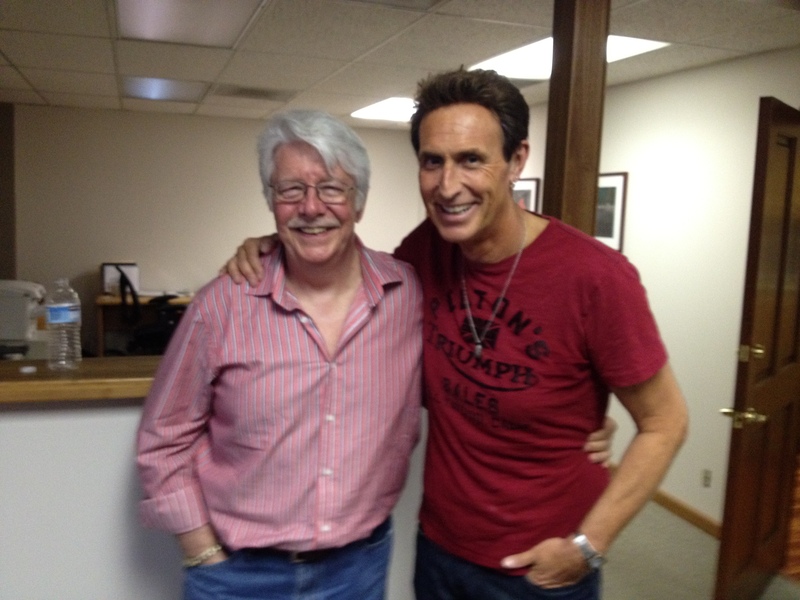 Reliving some of those days on the podcast with Brian was a joy … we never stopped laughing!! No.3 – Here I am with great friend Jack Hues (of Wang Chung fame), and yes, I think you can tell we had a damn good giggle together. I think Jack is telling me to get more of a suntan!! By the way, check out Wang Chung’s recent album, “TAZOR UP!”. No.4 – It was a privilege to meet the iconic producer and engineer, Ken Scott (The Beatles, David Bowie) when we were both guests on Mike Rodriguez’s Audio Nowcast podcast. Listening to his studio stories was both inspiring and motivating … and the man has a damn good English sense of humor – always a big plus in my book! 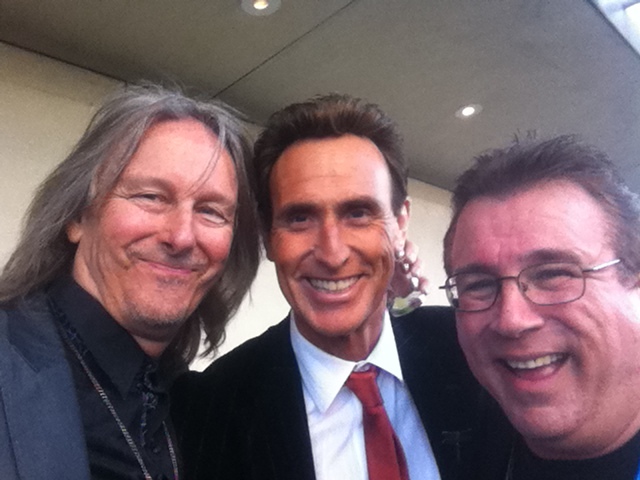 No.5 – Finally, here I am at the recent ASCAP Pop Awards with good friends Pete Leinheiser (of Gibson Guitars) and Ritch Esra (co-founder of the Music Registry series of directories – the music business “bible”). I had a great time catching up with many special friends from the industry, and Paul Williams (legendary songwriter and current President of ASCAP) gave a rousing and poignant opening speech to start off the proceedings, advocating “the good fight” that needs to be fought and supported for the rights of all songwriters in this digital revolution of streaming, pirating and a general lack of reverence today for the songwriter’s art and rights. A good evening was had by all. In closing, I just want to thank you all for your constant support of my work and your encouragement. You guys are part of my (musical) family, and you keep me focused on always trying to write, record and perform the best music I can. Track listing of Martin’s upcoming album, “A Temper of Peace” REVEALED!